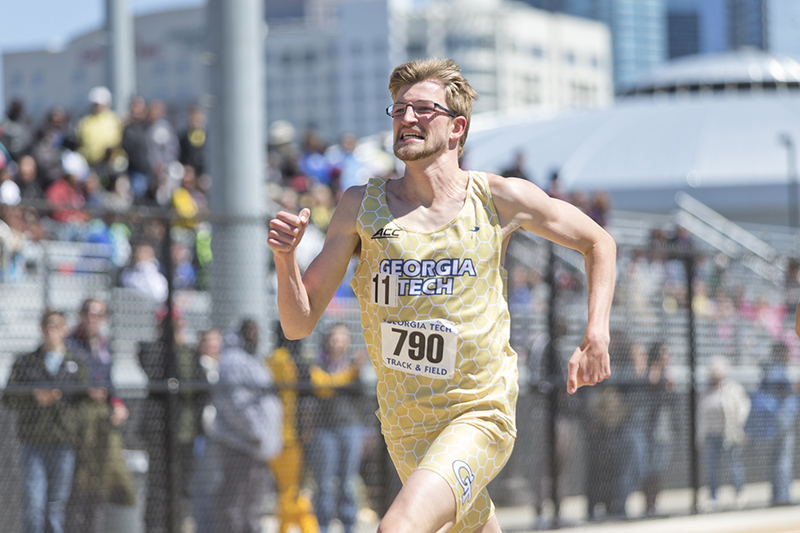 Track and field teams from thirteen universities filled the George C. Griffin Track this past weekend to compete in the 2015 Yellow Jacket Invitational. The Yellow Jackets were coming off of a successful showing at the Alabama Relays a week earlier, with eleven top-three finishes between both teams in Tuscaloosa. Among these were first place finishes by Jazmyne Taylor in the women’s 400 meters, Bailey Weiland in the women’s High Jump and Brandon Lasater in the men’s 1500 meters. The meet kicked off last Friday night with the men’s and women’s 5000 meters. Tech’s only competitor in the women’s race, Freshman Hailey Gollnick, finished 15th with a time of 18 minutes and 28.54 seconds. Of the seven Tech competitors in the men’s race, three finished in the top ten: senior Justin Weaver in third, sophomore Witt Nix in fourth, and freshman Tanner Shaw in sixth. The athletes returned to action early Saturday morning to compete in the field events. The women’s events were highlighted by a first place finish in the pole vault from senior Samantha Becker and a tie for third in the high jump from Weiland. Other top ten finishers were Ksenia Novikova in the pole vault, Carissa Tipler in the long jump and triple jump and Julia Frederick in the high jump. The men also had a strong morning, with seven of the eight athletes placing in the top ten in their events. Of note were three second place finishes by Ryan Thomas in the triple jump, Myles McDavis in the long jump and Nathan Daniel in the pole vault. The remaining running events took place that afternoon and included several more impressive performances from Tech athletes. The women’s team was able to secure two more first place finishes, with freshman Courtney Naser winning the 3000 meter steeplechase and the team of Jazmyne Taylor, Domonique Hall, Ama Larbi and Christina Pensock winning the 4×400 meter relay. The men also continued to place highly in their events with second place finishes from Spencer Allen in the 110 meter hurdles and the team of Lasater, Alexander Reese, Julian Darnen and Andres Littig in the 4×400 meter relay. Most impressive of all, however, was Tech’s overall performance in the 800 meters. On the men’s side, Littig finished first overall with a time of one minute and 50.35 seconds, his personal record in the event. Zane Coburg followed close behind, placing second in one minute and 52.31 seconds. Chris Burnett, Cole Jackob and Jag Gangemi finished third, fifth and 16th respectively. The women were almost as dominant with senior Morgan Jackson finishing in first with a personal record of two minutes and 10.5 seconds, Pensock placing third, and Malin Trollsas crossing the line 12th among 33 competitors. The Yellow Jacket’s attribute their success in the 800 to women’s head coach Alan Drosky, who also directs middle-distance workouts for both the men and women’s teams. Jackson echoed these sentiments, reiterating how important their practices are to their success. The pair will look to continue their dominance next week as the teams travel to Gainesville for the Florida Relays and then to Auburn for the Tiger Track Classic.